One of the most rewarding ways to work is by turning something you already enjoy into a career. For many people, cooking translates to a career path in the culinary arts. This field involves cooking or working with food in many different ways. While people may initially start out by studying a broad-based course, they can later focus on a more specialized field. Culinary school graduates typically find themselves working in a wide variety of jobs, including restaurants, hotels, hospitals, and even the military. Read on to discover more about this extremely practical and hands-on career path. There are many culinary schools around the globe, but only a few have gained a prestigious status, akin to the Harvards and Princetons in our world. Some of the most famous ones include Paris’ renowned Le Cordon Bleu, and the Culinary Institute of America. At a culinary school, students can expect to study theoretical courses as well as practical classes in a real kitchen environment. When considering culinary schools in the United States a key factor is ACF accreditation. This accreditation is granted by the American Culinary Federation, a professional group that oversees culinary education all across North America. It is not necessarily true that students have to pay skyhigh fees to obtain a culinary degree. There are several ACF accredited community colleges with lower fee rates that are also able to offer a strong education. Apart from the main tuition, students should also consider the additional costs of uniforms, books, cooking supplies, and their room and board. It is a wise idea for potential students to tour the school and its facilities before accepting any offers. In particular, take note of the facilities and the ratio of students to professors. Students who already have an idea of the culinary field that they wish to specialize in should find out whether the school offers related courses or a degree. Some schools may also have the option of work-study programs, thus allowing students to gain real world experience and potential employer contacts while still in school. Culinary Degrees – Learn all about deciding whether to attend a culinary school, finding an appropriate one, and applying to it. Culinary Schools – Use an interactive map to locate culinary schools and programs in every state in the country. Many students enter culinary schools with hopes of simply becoming a chef, however there is a wide range of other related careers that they can also pursue as an alternative since it can be somewhat difficult to obtain a well-paying job as a chef. 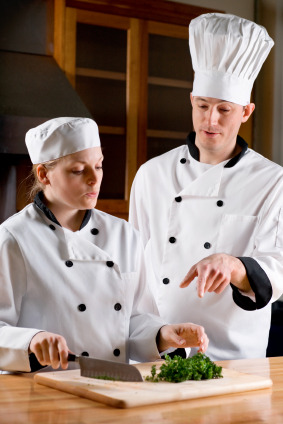 In 2008, chef and cook positions numbered approximately a million in the United States. Keep in mind that popular television cooking shows can be rather misleading. Many culinary students feel discouraged when they view small, cramped kitchen conditions that many restaurants tend to have. Several chefs who do create a highly successful career for themselves do so by opening their own restaurants, which allows them to create their own vision in terms of cooking, as opposed to adhering to another person’s menu. Some other examples of the paths that culinary graduates follow include food science technicians, dieticians, hotel line cooks, nutrition consultants, sous chefs, bakers, demonstration chefs, culinary educators, food researchers, restaurant managers, test kitchen chefs, and much more. Apart from cooking, a typical day for a chef usually also involves creating recipes and menus, food preparation, delegating work to sous chefs and assistants, training staff, and ordering supplies. A common experience for graduates is to work in a certain job and gain further skills and knowledge through on-the-job experience. Many culinary careers do require a degree or equivalent certification in culinary arts, as well as a certain amount of job experience. For example, an executive chef for an upscale establishment would normally be required to have several years of work experience as well as a formal education. Some careers, such as pastry chefs and culinary educators may also require the candidate to have ACF certification. Younger students need not feel overwhelmed by the breadth of experience that many older chefs seem to have. In fact, around twenty percent of kitchen staff in the United States are in their late teens. Chefs and Head Cooks – View a detailed job outlook for chefs and head cooks, including average salaries, education requirements, work experience, and job availability. Culinary Related Careers – Read more about working as a cook, a pastry chef, or in restaurants, along with some helpful tips about the types of skills and experience that are needed.